Because my Purim Crafts and Links pages are too long,I moved the recipes to their own pages. To go to my award winning Purim Crafts and Link pages, Click here. Thanks to the great website and video cooking lesson show, Feed Me Bubbeand Chalutz Productions for permission to use this recipe. I have been searching for years for a Yeast dough recipe like I remember my late mother made. She never wrote down recipes but did for Purim and Passover. She lost her Purim ones. Because these are yeast dough they take some prep but are really worth it! Can't wait to try these for next Purim! Add margarine and only enough of the flour to make a dough that is moist and pliable. Form the dough into a ball and place in large greased bowl. Cover with dish towel or plastic wrap in warm place and set aside to rise. 1 to 2 hours until double in bulk. Divide dough into 2 or 3 pieces. Cut the dough into 3 or 4 inch circles. Use the top of the glass or a cookie cutter. Fill each circle with a rounded tsp. full of filling. And pinch dough into a triangular shape. Cover and let rise again 15-20 minutes. Brush the top of each one with beaten egg white and bake on greased cookie sheet 2 inches apart for 20-25 minutes. Bake in a pre-heated oven 350 degrees 15- 25 minutes until brown. --------- Filling Nowadays you can buy the prepared poppy seed filling or prune filling in most markets where they sell kosher jewish foods. But for homemade recipes, check out the links to Shalom Boston.com on the right of this page. of all of the other craft and fun pages on my site. Large chocolate groggers. About 3 oz. of chocolate each! I bought the mold from Candylandcrafts.com's Jewish Molds This is one of many Jewish molds and Holiday molds they carry. 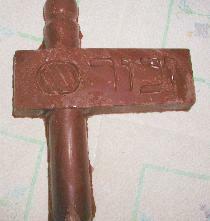 This mold makes two large candy grogger. It has a Hebrew word I have been told means something about remembering. 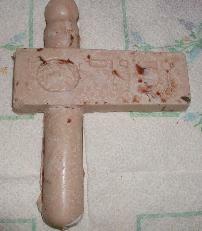 This mold as all plastic molds this company carries would be great for soap making or plaster too. So buy extra molds. Remember once a mold is used for non food don't use it for food. Some chemicals may stay on the plastic. They also sell small lollypop size groggers, Hamentasens and other Purim designs. I used chocolate and white chocolate (dairy) melting chocolate usually sold for dipping fruit or making chocolate almond bark. The package I used came in 12 2 oz cubes. I have two molds (4 groggers). I melted 6 cubes in a glass bowl at a time. Enough for one mold (two groggers). I melted in the microwave a few times at 30 second each. Making sure to stir after each 30 seconds. It took about 2 minutes for them to melt. I usually put all molds on wax paper in case I spill. 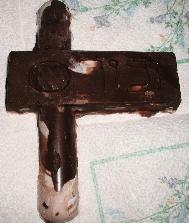 Make sure that mold is dry as water can ruin the melting chocolate because of its high oil content. I made some all chocolate. Others a combination of white and dark. Make sure to even the top (back of candy) with a spatula so the finished candy will lay flat. Also make sure to move the mold back and forth a few times to fill all of the design and to break up any air bubbles. Let sit for at least a half hour. Remove from mold. They should pop out if done with a little pressure. Be careful as the handle is lighter then the middle and this can snap the handle off the grogger. Great for giving in your baskets. If you wrap in a plastic baggie or cover with colored/or clear plastic wrap this would be very special for in side your Purim basket. When my children were in preschool they came home with Purim cookies. They loved them and wanted more. Many people of course have different traditions of cookie dough vs pastry dough desserts. I grew up with a yeast dough dessert. Of course my mother stopped making them years ago. She can't find her recipe. One of the rare moments when she used a recipe! So for years I have tried every cook book's or friend's family recipe for yeast dough. Still have not managed to get the light dough of my dreams. My kids of course could care less! So here is a version of the preschool recipe. Buy sugar cookie mix from the store. Add flour to make it a little stiffer. Shape into a small circle using a glass or free form. Add 1/2 teaspoon or so of jam, peanut butter with raisans, peanut butter with chocolate chips or whatever. Fold three corners to center. Leaving some of the filling showing. Bake until to done using the package directions as a guide. Buy from Jewish: Grocery Store, Day School or Purim Carnival. For real Purim recipes, check out the WWW resources on this page. Great list of Israeli and Jewish foods for Purim for many different traditons. Cookies, holiday dishes and many different Hamantashen recipes for both yeast dough and cookie dough. For more recipes from ShalomBoston.com go to their Recipes for Holidays and everyday archives. This page received an award from the Jewish Agency Of Israel!